This unique formula of herbs designed to address the seven different forms of the herpes virus. It has been used reduce the frequency, severity and number of outbreaks by supporting the immune system and defending the body against infection and disease. Infertility is a rising problem in today’s society. In many cases it can be reversed naturally when given the right resources. This formula contains False Unicorn and Lobelia. Both herbs are useful for issues that contribute to the inability to conceive. The following have been used traditionally to treat inflammation, especially in rheumatoid arthritis: Boswellia, Turmeric and Ginger root. 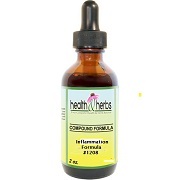 The natural herbs have been used to help decrease joint inflammation in men and women suffering from arthritis. Excellent for the external treatment of poison oak and ivy. Also useful for bruises, burns, cuts, eczema, insect bites, sores, sprains, warts, and ringworm. Jujube extract has potent health benefits. It has calming properties and is a good source of natural antioxidants. It has been used to help treat sore throat and is thought to help prevent common colds and cough. Has been used to lower blood pressure. Herbs for the lymph system that help to cleanse the body.Prickly Ash Bark, Sarsaparilla, Poke Root, Stillingia, Burdock, Red Clover Blossom, Barberry, Peach, Licorice, Echinacea, Pau D' Arco, Cayenne Pepper, Astragalus, and Chaparral.